Imagine spending your life to a tiny cage, tubes harnessed to your body. Imagine having your teeth filed to prevent you from protecting and harming yourself, waiting to be slaughtered for your gallbladder, feet and meat. Your gallbladder is worth a staggering 10, 000-20,000 USD and your paws are a delicacy served in discretion. Your pain is worthless. Your life is one of constant pain and confinement until you die. This is reality for thousands of Asian moon bears. 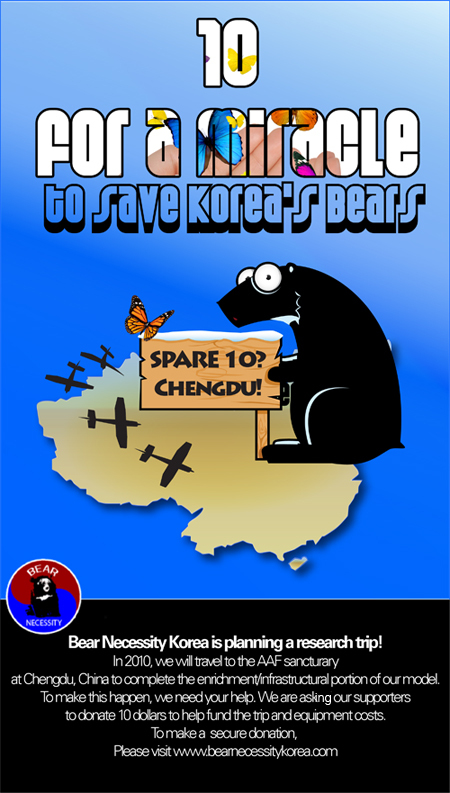 Bear bile farming remains a relatively unknown issue among both Koreans and Westerners. The Korean trade began in the 1980s with the importation of foreign bears in the hope of generating income among livestock farmers. While the Green Korea group acknowledges and supports action toward enforcing bear rights, most folks simply are not aware of the practice. In fact, according to a survey conducted by Green Korea, the majority (87.1%) of Koreans do not agree with bear slaughter for their gall bladders. And yet the trade continues. So what is it all about? The Korean Moon Bear, so-called for the cream-colored crescent moon shape located on its chest , was deemed a protected species in 1982. According to the Korean government, a mere 11 known Moon Bears reside in the South Korean wild. Despite such low numbers, there are currently 1,600 bears at 110 Korean bear farms, mostly in secret locations near Daegu, and 7000 at locations in China, most of which lack regulation. In 2005, the Korean government announced a policy that allows bears older than 10 years to be slaughtered for their gall bladders. 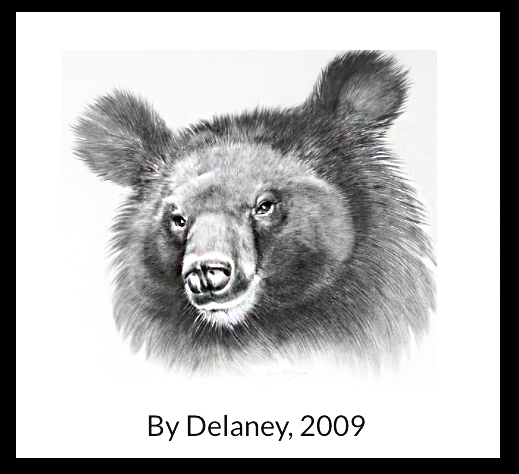 The former age of 25 posed too great a challenge for farmers as few bears lived long enough to be ‘legally’ slaughtered for their parts and strong market demand called for more lax policies. Common legal practice mandates that the famer slaughters the bear in the presence of the customer, thus ensuring authenticity. Bear bile has been used in Traditional Chinese Medicine for over 3000 years. It contains ursodeoxycholic acid (UDCA), which is believed to reduce fever, protect the liver, improve eyesight, break down gallstones, and act as an anti-inflammatory. It is also believed to be an effective treatment for chronic stomach disease and heart disease and is touted as a general ‘cure for all ills’. Products include rheumatic oil, hemorrhoid cream, revival pills, plasters for sprains and as well as raw bear bile in both liquid and powder form. Their distribution is now illegal in North America but contraband can still be found in Oriental shops. Practitioners acknowledge that bear bile is unnecessary from a medicinal point of view. According the Animal Concerns and Research Society (ACRES), there are at least 54 herbal alternatives to discourage the farming of bile. While the dog meat tradition tends to steal the activism spotlight in Korea, bear farming has ignited heated responses from animal rights lobbyists who argue the practice is both unnecessary and cruel due to the methods used to extract bile. Bear farmers argue on behalf of the trade and insist that the use of captivity-born animals is reasonable and ethical. According to the Green Korea Group, the government does not monitor bear farms to ensure guidelines are followed, nor does it keep a record of the actual number of bears being kept on farms. Mu-ung Kim (whose name ironically means ‘no bear’ in Chinese), is Chairman of the Union of Korean Bear Farms. Mr Kim asserts that the deregulation of bear farms will allow Korean farmers to compete with imported bladders from China, therefore discouraging consumers from seeking foreign products and improving the local livestock trade. He argues that what occurs outside of Korea, namely a rising number of bans on practices relating to endangered species, is not relevant to Korea and that Koreans ought to keep in mind that the bears are born in captivity. Green Korea maintains that increased liberalization of such laws will encourage people to view other wild animals as resources for commercial use. Education is paramount in protecting endangered and threatened animals. ‘Bear Necessity Korea’ seeks to ensure that Korea enjoys a future that includes this majestic species, once revered as the mythological ‘Mother of the Korean Civilization’. We are a group of individuals from numerous nations, dedicated to putting a stop to the bear bile trade through the production of educational media, the establishment of suitable bear sanctuaries and the provision of financial support. We seek volunteers to assist with media needs, ask for international veterinary aid and bio-medical advice and promote the concept of a bear sanctuary or rehabiliation facility system. We believe that through planning, research and support from both the government and private donors, we can salvage this species so that future generations may enjoy the majestic moonbear as a national treasure in the wild. You can help support the BNK effort by donating, volunteering or simply spreading the word about Korea’s moonbears. Help us HELP BEARS – TOYS!